I returned to the University of Illinois from what I thought was a rather successful trip to universities in East Asia to discuss collaboration in internet education with universities in East Asia. I was at the time an assistant professor in the Department of East Asian Languages and Cultures. It was an unusually hot July in 2000 and I had to move into a new apartment in a few days, so I felt but overwhelmed and also infinitely excited about the possibility of holding live video seminars with my peers in Asia in the near future. I was quite optimistic as I thought that this trip to Asia was one that would determine my career. But I found an article in the school paper Daily Illini that had come out while I was in Asia that suggested something else was going on. I was quite puzzled by the negative statements in the article and sensed that something was very, very wrong. Although I did not know it then, my life would never be quite the same again. University professor Emanuel Pastreich is spending the rest of his summer vacation touring the campuses of some of East Asia’s premier universities. Pastreich, an assistant professor in East Asian Language and Culture at the University, left Tuesday for Seoul, Korea, hoping to develop contacts which will lead to preliminary discussions with administrators of some of East Asia’s leading universities. Pastreich will only talk with administrators at the East Asian universities. He is not serving as a formal representative of the University, said Jerry Packard, head of the EALC. “We in the department told him to cool his heels and take things in a methodical fashion, but he’s chosen not to do that,” said Packard. The EALC has not given any funding for Pastreich’s trip. Representatives said that University administrators “have not decided whether they want to buy in” to Pastreich’s plan. Pastreich said he has contacted other departments, but Packard said he thought Pastreich was paying for the trip largely out of his own pocket. The technology necessary is already largely in place, but there are still substantial challenges. If Pastreich felt getting University support was difficult, he might face even more challenges overseas. While the University has used videoconferencing to create collaborative courses with schools in the United States, the international exchange would be the first of its kind. Pastreich envisions East Asian history courses taught using video lectures that students could watch in class or online. Students at different universities would complete group projects using e-mail. Pastreich will visit the University of Tokyo, Seoul National University and Peking University in hopes of creating a series of courses that will use videoconferencing and the Internet to link students across the Pacific together for classes. “The most exciting thing to me is that students here, who maybe know Pokemon or tae kwon do, or like Chinese food get a chance to experience East Asian culture,” said Pastreich. 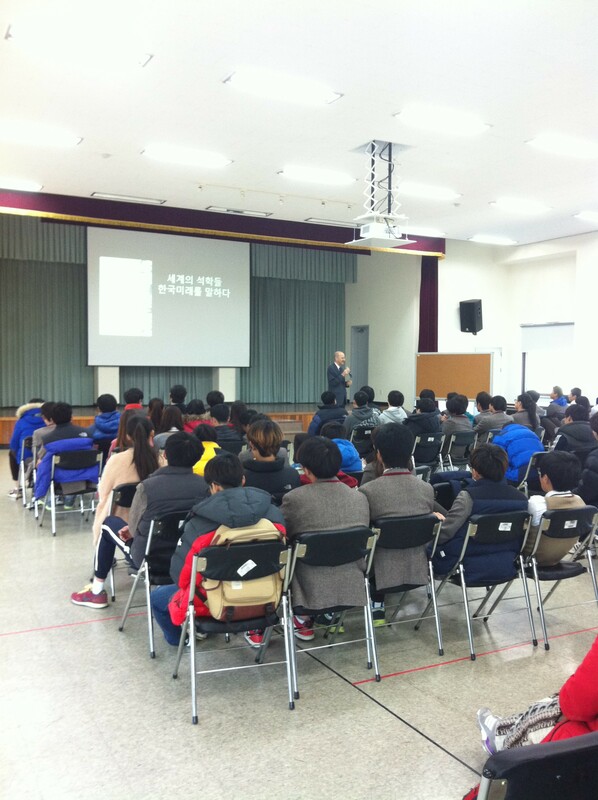 I had the honor of delivering a talk at Dasom High School in Jaecheon Korea on November 3, 2014. The talk related myexperiences working in Korea to a group of students for whom many have a non-Korean mother and a Korean father (although Korean students and other foreign students were also included in the audience). Dasom High School was opened several years ago by the government as part of an effort to increase opportunities for multicultural students (which in Korean means those with one parent Korean and one parent non-Korean) in society. The talk focused on Korea’s tremendous appeal and potential as a multicultural society. I wanted to suggest that those with mixed parentage may well go on to play a central role in Korean society as it evolves in the years to come. I was deeply impressed by the sincerity of the students and their honest desire to learn and grow. I do hope many will join the Asia Institute. 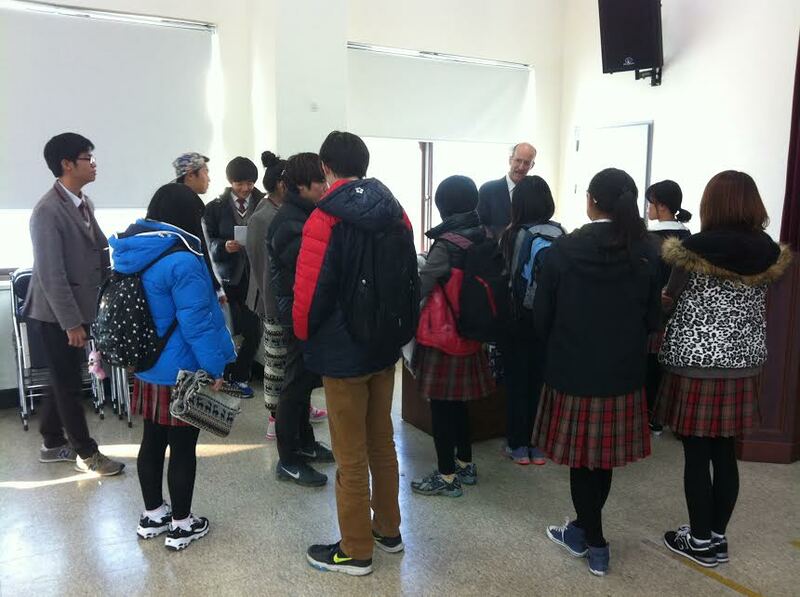 Emanuel speaks to students at Dasom High School about Korea’s tremendous potential as a multi-cultural society. The discussion with the students was an inspiring opportunity to discuss how those from other countries and those with mothers (or fathers) from other nations could play an increasingly important role in the nation. 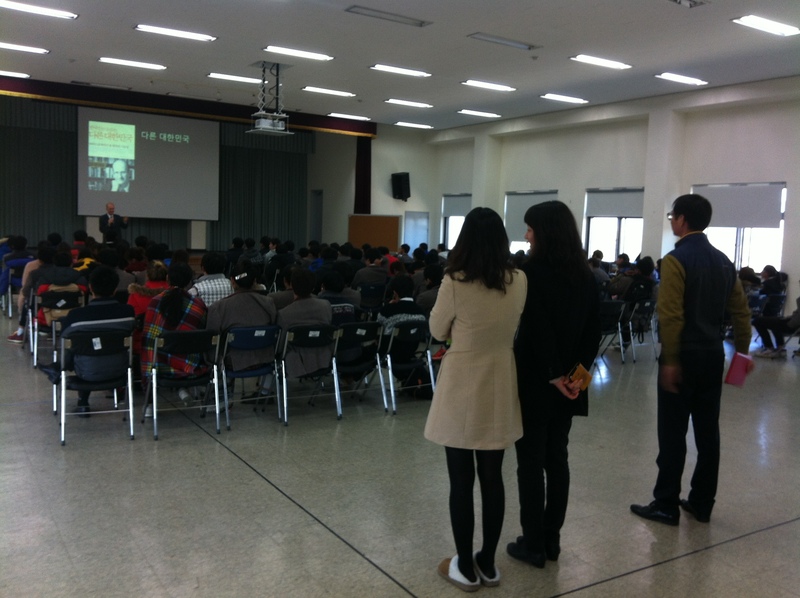 Several of the teachers at Dasom High School watching from the rear. Emanuel most enjoyed the direct discussions with the students.